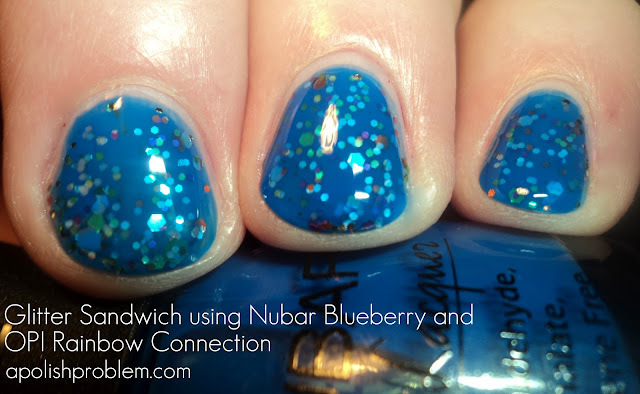 In my previous review of Nubar Jellybeans, Leona Carolina asked if the polishes could be used for glitter sandwiches. Great minds think alike because that was something I'd been asking myself as I was reswatching the collection. For the most part, the answer is yes. However, I wouldn't recommend doing the glitter sandwich method with Nubar Cherry as the base is just too thick (I tried and it was a fail). That said, all of the other 7 polishes can be used for glitter sandwiches and frankly, I think that is a fantastic use for them. By the way, if you are unfamiliar with glitter sandwiches, basically it means that you sandwich a glitter topcoat (usually with a clear base) in between 2 layers of jelly polish. For testing purposes, I used 2 of the Nubar Jellybeans, a light shade and a dark shade, Nubar Strawberry and Nubar Blueberry respectively. I also used OPI Rainbow Connection as the glitter in both examples. This is 2 thin coats of Nubar Blueberry topped with 2 coats of OPI Rainbow Connection and another thin coat of Blueberry. I'm in love with this. I may have to do this as my blue nail of the day for a day in April. Of the two I tried, this look was my favorite. 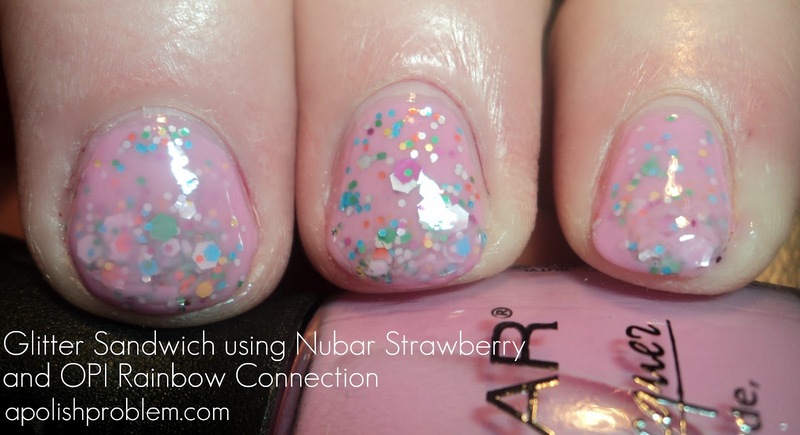 This is 2 thin coats of Nubar Strawberry topped with 2 coats of OPI Rainbow Connection and then another thin coat of Strawberry. To me, this really looks like Deborah Lippmann Candy Shop. I did this one first, so I was a little unsure on how much polish to use when I topped the glitter. On my ring finger, I used the least amount of polish over Rainbow Connection, and I think it looks the best. Because my coats were thicker on my middle finger and my pinky, I did have pooling at the tips. So when you do this, be sure to wait a little bit between the coats, and use a thinner coat over top. I think you could probably do fantastic glitter sandwiches (anyone else pronounce this in their head as "glittah sammiches"? No? Just me?) with almost all of Nubar's Jellybeans collection. I can't wait to try one with Blue Raspberry. Also, if you were waffling on this collection due to streakiness, if you like glitter and like using the glitter sandwich method your nails, you may want to pick one or two of these up as they are perfect for that application. Ooh, nice! I wasn't really interested in this collection up to now--but if they work with my beloved glitters, I might have to give them another look. P.S. Any chance you'd consider turning off word verification for comments? My eyes go all wonky trying to figure out the words. Karen, I hate those things, too. I didn't even realize that I had word verification on my comments. LOL. I will gladly turn it off. I love these combos! I might have to seek out this Nubar collection! Thanks for the post - and for answering my question! I love how Strawberry looks, it reminds me of sprinkles (100s and 1000s... not sure what you call them in the US!). I'm definitely buying the Jelly Beans collection now so I can play around. You're welcome and thank you for the suggestion! They work perfectly for glitter sandwiches. Mmm, the strawberry/rainbow looks good enough to eat!! Looks so gorgeous, I need to get some Nubar jellies too!